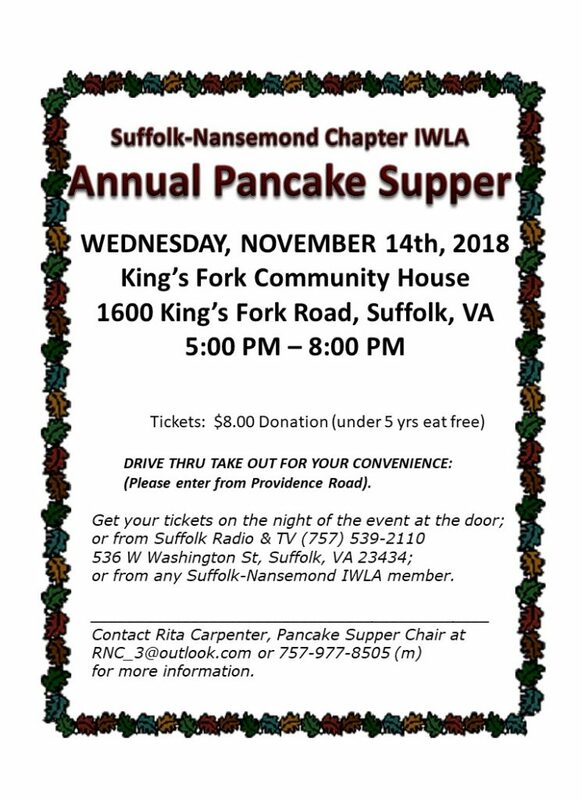 Members, please help make our annual fundraiser a success by helping us sell tickets for the upcoming annual chapter Pancake Supper on Wednesday, November 14th, 2018! Rita Carpenter, Pancake Supper Chair, will be passing out volunteer roster sign-up sheets at the October dinner meeting on Wednesday, October 17th. The goal is to have pancake supper tickets for resale printed and available for pickup at the dinner meeting sign-in desk. Also Wanda Gerard, our membership chair, will be mailing pancake supper tickets to those members who do not attend the October dinner meeting. or 757-977-8505 for more information. To download a printable 2018 Pancake Supper Flyer, click on the image below.